'Free college for all' or 'Free college for most'? In a perfect world, the government would have enough money for all. But, in the current political climate, I'd settle for directing the money to the the most financially needy. I want government to give away subsidies to people in need or to change people's behavior. Giving money away to people who have enough and were already going to buy a product (college education) does neither. New York may make waves for offering tuition-free college, but there is still the pesky problem of books and living expenses. Meanwhile, California has been quietly charging tuition, but rebating it back to low and middle-income families. In fact, most families will pay less under the CA system because CA offers more aid for living expenses. 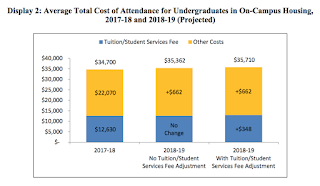 Consider the University of California budget for 2018-2019 that was recently adopted. 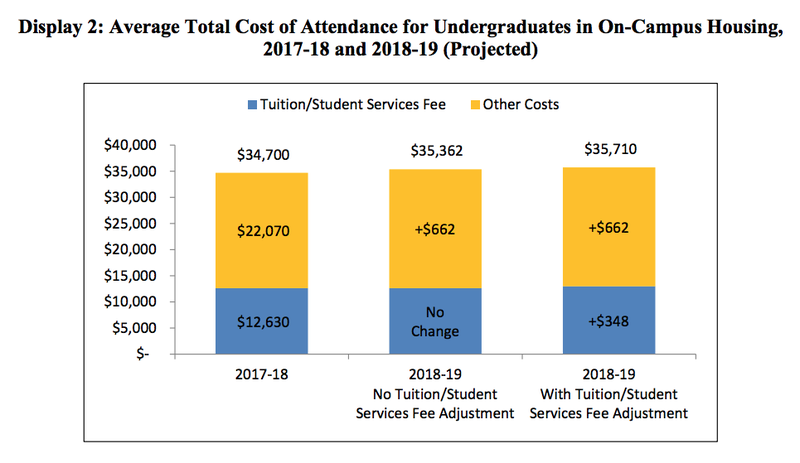 It includes a small increase in tuition, but the bulk of UC costs is not tuition. Living costs and books dwarf tuition two to one. By charging tuition, and then redirecting those dollars to financial aid for needy students, many students and their families pay negative tuition. That is, their financial aid is greater than the amount of tuition. The median family income for CA families with children under 18 in 2010-2014 is $61,991. If students start at a community college (CC) and live at home for the first 2-3 years, they can reduce the cost even further. About half of CA CC students received full tuition waivers. They only had to cover books and transportation costs, and those were subsidized for the neediest students. Starting next year, the first year of California community college would be tuition-free for everyone. One third of all UC graduates were CC transfer students. They typically move away and live on campus at an UC for only the last 4-5 semesters. CA has effectively had free college for most, if they can get over the hurdle of being prepared to take advantage of it. This is where I think CA--our entire nation--could do better. Notice that families with children under 18 have a lower income than families without children? Not only are children expensive, but they impair their care-givers' ability to work for cash income. This is why we need cash transfers from the unencumbered to the people who work hard to raise the next generation of citizens/tax-payers. 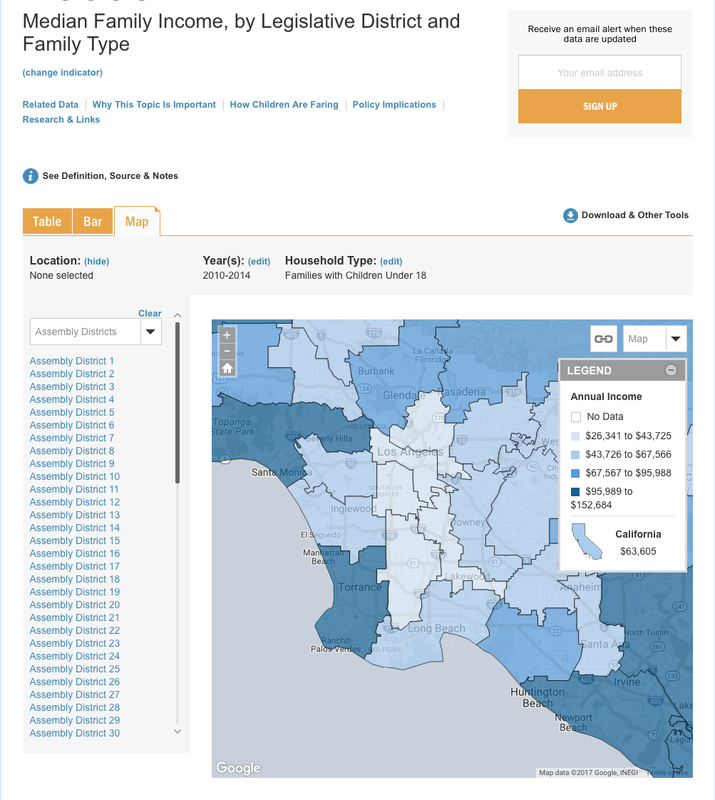 Look at the incomes for families with children under 18 by CA state assembly districts. 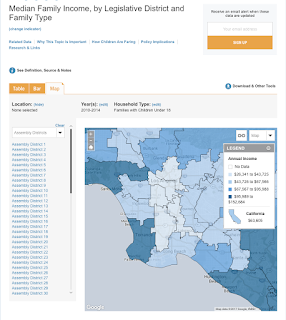 Consider the median family incomes in South LA, district 59. Imagine raising kids on $26,341/year. Note that families with children are poorer in district 59 than those without. That is one quarter the income of families in the South Bay region, district 66. Although families in this area with kids enjoy higher incomes than families without kids, the income difference is slight compared to the cost of childcare and other child-related expenses. I want to be clear that, given the high cost of living in LA, $100,000/year is not luxurious at all. But you cannot compare two-parent families earning $100k/yr with one parent families earning $25k/yr. Every family in the latter group that manages to raise their children to be college-ready has achieved something heroic and earns my enthusiastic support.